Fluid mechanics is the branch of mechanics that deals with the properties of fluids in various states and their reaction to forces acting upon them. Pressure is defined as the force per unit area and its SI unit is Pascal (Pa). But the imperial unit, psi is commonly used in in aircraft engineering. The formula is given below. Both liquids and gases behave in a similar way with the ability to flow and occupy any shape. The air when compressed quickly to rise the temperature is known as adiabatic compression. And the gases when compressed slowly to maintain constant temperature is known as isothermal compression. All materials have bulk modulus (K), which is defined as a value related to the pressure increase required to decrease the volume by a certain factor. The bulk modulus of water (Kwater) is higher than that of air (Kair). Thus, the water will change its volume slightly when pressure is applied, whereas air will change volume readily. The pressure exerted at a point within a fluid is the same in all directions. The pressure exerted by a fluid at right angles to the contact surface. The pressure is felt throughout the fluid without any loss. Gases are compressible whereas liquids are incompressible. But they both will compress a little, depending on their bulk modulus. The hydraulic systems are used in aircrafts to retract landing gear, operate flaps and power steering by the transmission of fluid pressure. The Bramah press is a hydraulic pressing machine, which was invented by Joseph Bramah. The system is shown below. This principle is used in hydraulic lifting jacks. It consists of two linked cylinders connected together by a pipe. Each cylinder has a close fitting piston that provides a leak proof piston and cylinder arrangement. For practical reasons, the liquid in the system is considered incompressible which behaves like a gas at very high temperature. As the small piston ‘x’ is moved in, the fluid is pressurised which is felt throughout the fluid and cylinder. However, the force exerted by piston ‘y’ is larger than the applied force at cylinder ‘x’, due to the larger area in cylinder ‘y’. 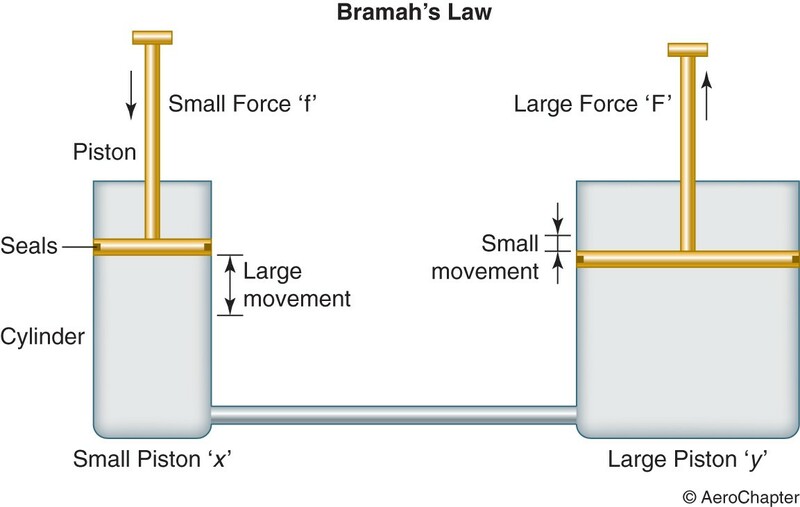 So, a comparatively smaller force on the small piston can be used produce a much larger force on the large piston. But the movement of large piston will be small when compared to the movement of the smaller one. As far as aircraft is concerned, the relationship of pressure and depth is of little concern. When considering the atmospheric depth, the air column reaching up to the atmospheric limit creates a downward pressure of approximately 101.3kN/m2 at sea level, and as altitude increases there is less air column above with the pressure decrease. When considering liquids, the pressure created due to depth is more obvious. This becomes a problem for the divers and submarines, as they have to withstand considerable pressure limits in order to avoid being crushed in the water. The pressure measured from an absolute vacuum is known as absolute pressure, whereas all other pressures are considered as gauge pressures. A reading of gauge pressure may be converted to absolute pressure by using the following simple formula. 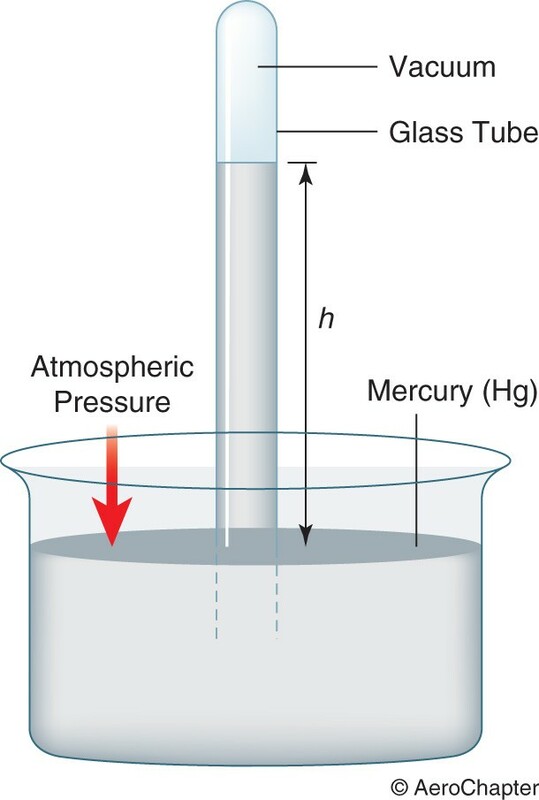 The mercury barometer is an instrument used for measuring pressure by showing the height of column of mercury that is contained in a glass of 1m long. By immersing the glass laying down on its side in mercury container, it completely fills with mercury. The mercury falls a little from the sealed top-end leaving vacuum. The height of the mercury depends on the atmospheric pressure and provides a direct relationship with atmospheric pressure. The resulted accurate readings can be used for forecasting weather and calibrating pitot static instruments. The standard atmospheric pressure at sea level is 29.9inches Mercury. The formula for calculating pressure (P) using the mercury barometer readings is given below. The piezometer is an instrument, which is used to determine pressure. It can either act as a device that is used to measure liquid pressure in a system by measuring the height to which a liquid column rises against gravity, or as a device which measures the pressure of groundwater accurately at a specific point. It consists of a tube vertically inserted into a container carrying the liquid under pressure. The liquid rises up the tube until the pressure due to its height. This level is equal to the pressure in the pipe and thus indicates the pressure level in the vessel. The piezometer can only be used for liquids and the height of the tube must be very long for liquids with low density. 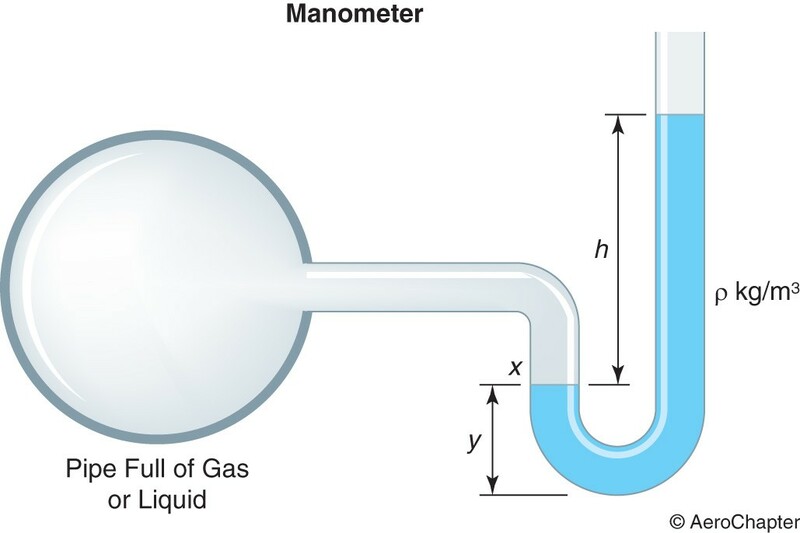 The manometer is an instrument that uses a column of liquid to measure pressure, although the term is often used to refer any pressure measuring instrument. 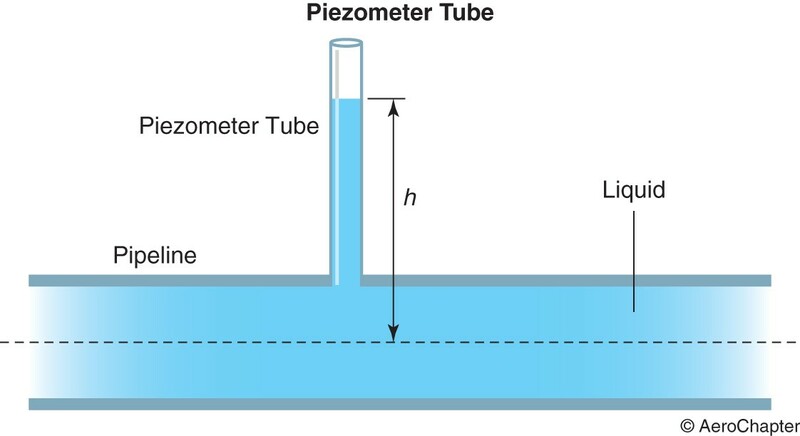 In order to overcome the problems associated with piezometer, this instrument has a U-shaped tube attached to a pipe carrying fluid under pressure. The pressure of the fluid in the pipe forces the liquid around the U-tube until the height produces a pressure which equals the pipe pressure. For gases, the pressure at ‘x’ is considered as the pressure used to measure the pressure of the liquid column in the pipe. This instrument is widely used in wind tunnel testing structures like aerofoils and airframes.